Okay… the genealogists beat out the lawyers. In that niche category, the newcomer, the winner and new champion — The Legal Genealogist. This tale began back in November when I got an email with a return address of americanbar.org — and I almost deleted it. I figured it was a pitch for membership in the ABA and, since I’m not in active law practice any more, and don’t have an active law license, I had my finger on the delete key when I realized it was about something else altogether. Now that seemed like fun. But there was this beauty-contest aspect to it — the voting for top honors in each category. And that was kind of scary. I was in a hot and heavy contest with a law professor from Texas who writes about wills, estates and trusts. I wouldn’t have minded losing to the winner in the Criminal Justice category — a blog I suspect many genealogists voted for — Defrosting Cold Cases by cold-case consultant Alice de Sturler. Or to the winner in the For Fun category — Jessica Mederson and Josh Gilliland’s The Legal Geeks. But hey… in my own category I was out for blood. And you, dear readers, came through. 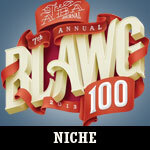 Addendum: This image to the right here is the official Niche Category winner’s badge, sent today by the ABA Journal staff. I’d have never lived it down if I’d lost out to a blog on wills and trusts. Great news – congratulations! So well deserved! Thanks, Debi! Sure appreciate everyone’s support! How do you think the wills and trusts blogger feels ?? Congrats !! I’m sure he’s very disappointed… but hey… if a blog about dead people is gonna win, let it be one about the lives and family histories of dead people! Congrats, Judy! I look forward to your new posts everyday. You’ve gotten recognition you deserve. Just found your blog recently and have it now on my list of several genealogy blogs I follow. So glad you won since I didn’t get a chance to vote – this time! I only voted once as well. I’m glad that was enough. Thanks, Nancy! I don’t think the lawyers knew how much the genealogists would stick together! Congratulations, much deserved! 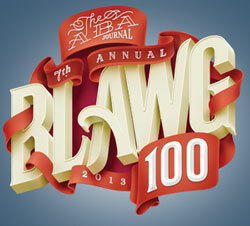 “Blawg” reminded me of hawg-calling, till the incorporation of “law” dawned on me. Thanks for every single column! It took me a while to figure out “blawg” as well. Congratulations, Judy. Couldn’t have gone to a more worthy recipient. I don’t know if my vote counted or not because my computer froze up and I was afraid to go back again because I thought they might sent the lawyers after me. Or the cops. Congratulations! I’ve just recently found you but thoroughly love your blog. Thanks so much for the kind words, Kris! Hooray! Well deserved! Happy to have stuffed the ballot box…er I mean voted [once] for you! Happy Year, Judy! See you at PMC & SLIG! Thanks, Skip! See you very soon!! Hurray!! Congratulations on your well-deserved win Judy! Congratulations, Judy! In your first year, too, well done. I don’t actually have contact info for you, but if you email me at lee.rawles[at]americanbar.org, I have a winner’s badge for you! Our graphics department made them, they’re very pretty. Thanks, Lee — I just sent you an email! Congratulations Judy! The honor is well deserved. Yours is a blog that I have discovered this year as well after I took my DNA test. You provide the latest updates in the genealogical field, a legal perspective to various aspects and with a sense of humor as well. Thanks for the kind words, Ben! I am glad we are both winners! Congrats and happy 2014. Thanks, Alice, and congratulations to you too! So many genealogists were thrilled to see your blog on the list — we love cold cases (some of them a bit colder even than those you write about). Congratulations! What great way to start the new year! I know people say “It’s an honor just to be nominated” but winning is sure way more fun! Winning beats losing any day, Pat! Thanks for the kind words. I am so glad to be hearing a fanfare. The brainsqueeze it took me to figure out how to sign in to vote would have been worth it even had you not won in the category. Your fond readers can do little to encourage your fine work — so it’s great that enough of us joined the chaaaaarge! Thanks so much for the very kind words, Jade! Much appreciated! Right on! Genealogists need to stick together! Congratulations! It’s a Win — and this is no surprise! You have worked hard — and thoroughly, and this in a fully and profoundly professional manner. Your recognition and all the accolades are well-deserved. Thanks so much, Dave. Much appreciated! The better blog definitely won! Ded Peeple Hunters, unite! You deserve the award because your blog is very informative, funny, and professional. I look forward to it every day, and I always get a chuckle while I’m learning something. What you provide genealogists is often information about courts, records and law that is difficult to find anyplace else or presented in a way so it all makes sense. Awww… thanks so much, Becky! BTW, can you stick your badge on the front page of your site?